The Democratic People's Republic of Korea (DPRK) is ready to return to the negotiating table to resume nuclear talks if the conditions are right, visiting DPRK Premier Pak Bong Ju said Tuesday. Starting his first official visit to China after taking office in 2003, Pak's tour comes a day after US Secretary of State Condoleezza Rice left Beijing after her 24-hour stop. "DPRK's stance of maintaining a nuclear-free peninsula as well as to resolve the nuclear issue through peaceful means and talks remains unchanged," said Pak at a meeting with his Chinese counterpart Wen Jiabao. "DPRK neither opposes nor will abandon the six-party talks," he stressed. "The DPRK will participate in the six-party talks as soon as the time is right." China suggests seeking a peaceful resolution and six-party talks in dealing with the Korean Peninsula nuclear stand-off, which is vital to the peace and stability of Northeast Asia, said Wen. It is a "realistic option" to resolve the matter through dialogue, Wen said. 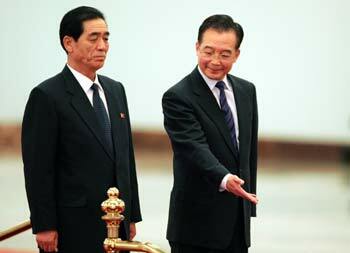 "The six-party talks are in the interests of all parties and should continue," Wen said. 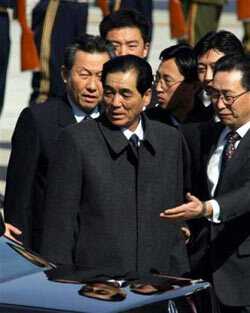 He urged all sides to show flexibility, sincerity and patience. The DPRK appreciates China's efforts for realizing a nuclear-free Korean Peninsula, Pak said. China has hosted three inconclusive rounds of talks involving the DPRK, the Republic of Korea, the United States, China, Japan and Russia; but a fourth round planned for late 2004 never materialized. Meanwhile, the DPRK said on Monday that it has increased its nuclear arsenal to help prevent a US attack. "We've taken serious steps to boost our nuclear arsenal and we are also prepared to mobilize all of our military force against any provocative moves by the enemy," the Seoul-based Yonhap quoted the DPRK's state KCNA news agency as saying. The statement came as Rice said on Monday in Washington the Asian allies of the US would have to find new ways of dealing with the DPRK if it continues to shun nuclear disarmament talks. Although she has also said the nuclear stand-off "cannot go on forever," Rice has repeatedly emphasized the United States has no plans to attack the DPRK. Last month, the DPRK officially declared for the first time that it had nuclear weapons; it also announced it was pulling out of the six-party talks. After their meeting the two leaders also appeared at the signing ceremony of two deals on the promotion of investment and environmental protection. Pak will meet Chinese President Hu Jintao Wednesday. Showing great interest in China's economic reforms, Pak plans to visit some factories and plants in Beijing, Shanghai and Liaoning Province during his week-long visit, diplomatic sources said. Yesterday he toured a telecommunications workshop in Beijing, officials said. Pak visited China in 2004 accompanying DPRK's top leader Kim Jong Il.